Brioche knitting is both thick and stretchy. 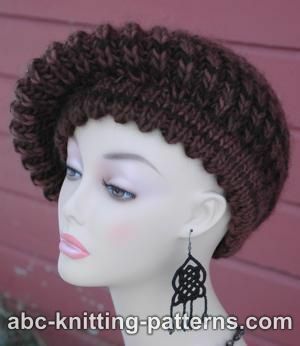 This makes it perfect for cold-weather items like hats, and that's why I chose it for this beret. 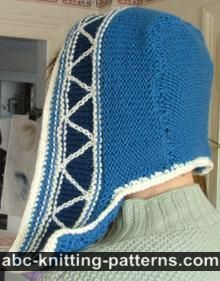 In order for the brim to match the thickness of the brioche top, I decide to double it up. This also adds durability. 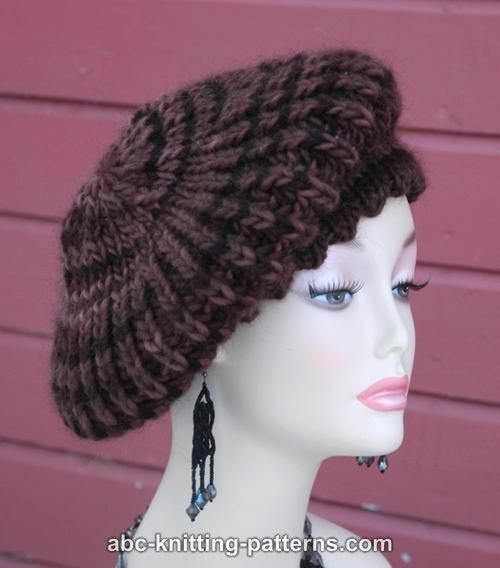 The beret is knitted from the bottom up, back and forth, with a back seam. 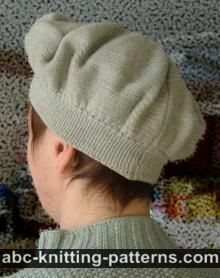 The body of the beret is worked in one-color brioche. The brim is worked with the eyelet row halfway. The brim is then folded along the eyelet row and sewn. 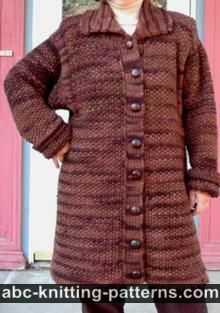 The eyelet row forms the picot edge. This ensures that the brim lays flat when folded over. Brim circumference: 17" (19") [43cm (48.25cm)] blocked and unstretched. Materials: Lamb's Pride Bulky 125 yds/114 m per 4 oz/113 gr skein - 2 skeins. Color: M-260 Cafe au Lait. Please note that I use Nancy Marchant terminology for brioche stitch. I highly recommend her books Knitting Brioche: The Essential Guide to the Brioche Stitch and Knitting Fresh Brioche: Creating Two-Color Twists & Turns, as well as her lessons on craftsy.com. m1 (Make 1 increase) - I used the increase described by Elizabeth Zimmerman: make a backward loop over the right-hand needle. Row 1: *yfsl1yo, brk1, repeat from * across. The number of stitches for size M are given in brackets. Cast on 52 (58) sts. Row 1 (RS): sl1, knit to the last st, p1. Row 2: sl1, purl to the end of the row. Rows 3-6: repeat rows 1-2 twice. Row 7 - Eyelet row: sl1, k1, *k2tog, yo, repeat from * to the last 2 sts, k1, p1. Row 8: sl1, purl to the end of the row. Rows 9-14: repeat rows 1-2 three more times. Row 15 (increase row): sl1, k1 (4), *m1, k4, repeat from * eleven more times, k1 (4), p1. 64 sts (70 sts). Row 16: sl1, *yfsl1yo, k1, repeat from * to the last st, p1. Row 17: sl1, *yfsl1yo, brk1, repeat from * to the last st, p1. Repeat row 17 thirty three (33) times. Row 51: sl1, *p1, k1, repeat from * to the last st, p1. Repeat row 51 three more times. Row 55 (decrease row): sl 1, k1 (4), *k2tog, k3, repeat from * eleven more times, k1 (4), p1. 52 sts (58 sts). Rows 56, 58, 60 and 62: sl1, purl to the end of the row. Row 57 (decrease row): sl1, k1 (4), *k2tog, k2, repeat from * eleven more times, k1 (4), p1. 40 sts (46 sts). Row 59 (decrease row): sl1, k1 (4), *k2tog, k1, repeat from * eleven more times, k1 (4), p1. 28 sts (34 sts). Row 61 (decrease row): sl1, k1 (4), *k2tog, repeat from * eleven more times, k1 (4), p1. 16 sts (22 sts). Fold the brim along the eyelet row and sew with invisible stitch. 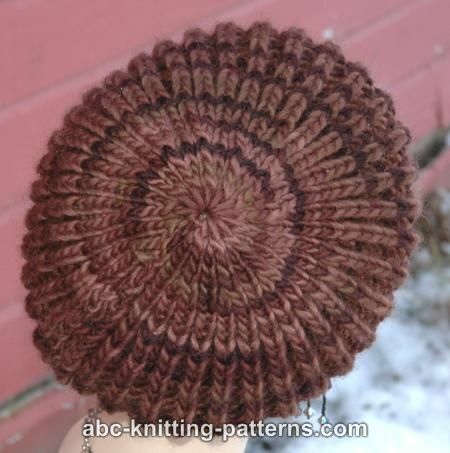 is it possible to knit this in the round? Do you increase 12 stitches on row 15 doing k1 p1? In the fisherman's rib section of the pattern: Does the "Rib: 1k, 1p mean knit one row, purl one row; or knit one purl one across a row?